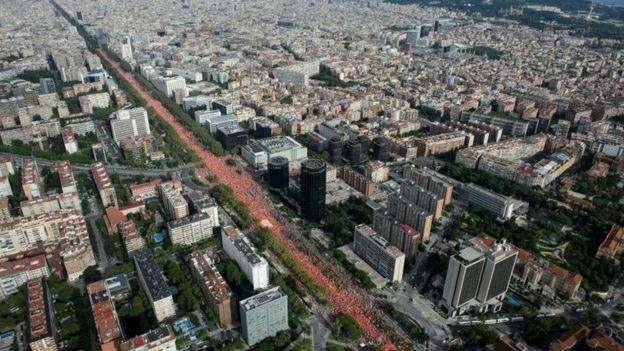 About a million people have taken to the streets of Barcelona to mark Catalonia’s “National Day” and show continued support for independence. The annual celebration is the first since Catalonia’s failed attempt to break away from Spain last October. Tuesday’s Diada holiday marks the day Barcelona fell to the soldiers of King Philip V in 1714 and for the past eight years has been used as a rallying point for independence. But the bid failed after Spain’s constitutional court deemed the move illegal and Madrid imposed direct rule. “I will demonstrate every year, as long as I can… I fight for [my children and grandchildren] so they will have a better life than the one we have had,” she said.